Twenty-five years ago it seemed highly unlikely that Kevin Millar would be in the spotlight setting the tone for one of MLB’s iconic franchises. In the 1993 MLB amateur draft, 30 major league teams each selected 50 prospects each to join their organization. ARod was the number one pick, and the Red Sox selected Trot Nixon seventh overall. When the teams finished their 1,500 selections, Kevin Millar’s name was not among them. But Kevin Millar’s story is one of determination and perseverance. It is a story that offers hope to every un-drafted prospect and player in the low minors. And it is a story about a genuine love for the game. When Kevin Millar was four years-old he played tee-ball in a league for five year- olds. After his mother and father divorced he played for the Little League in Santa Monica where his mother lived and in Valencia where his father made his home. “I was playing a 40-game schedule when everyone else was playing 20 games,” he laughs. After finishing high school Millar enrolled at Los AngelesCityJunior College where he excelled on the diamond and then he enrolled at LamarUniversity in Beaumont, Texas. And how did a young man from southern California end up in east Texas? Kevin Millar spent five years in the Marlin’s minor league system before he finally made it to the major leagues to stay. Did he ever get discouraged or give up on his dream? “No, I always believed I would make it to the big leagues. Since I was a little kid I had told people I would play in the majors and I always believed it. I got frustrated, even angry, about my playing time,” he admits. “But I never gave up on my dream. Millar played in 105 games with the Marlins in 1999, and over four seasons he established himself as a solid major leaguer. In 2001 he hit .314 for Florida and he slugged 20 home runs. The South Florida Chapter of the Baseball Writers of America voted him their “Most Improved Player” in 2001 and in 2002 they gave him their “Good Guy” award. It’s hard for Red Sox fans to imagine Kevin Millar playing for a team and not being able to communicate with its fans in their native language, but he almost played the 2003 season for the Chunichi Dragons in Japan. Fortunately the Red Sox claimed Millar from the waiver wire so he didn’t have to learn how to say “cowboy up” in Japanese. 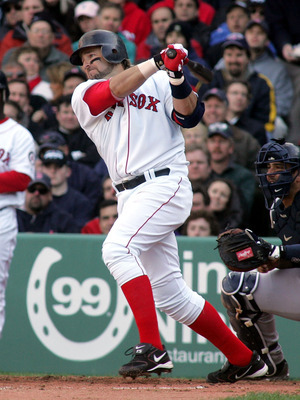 And he became a key part of the robust Red Sox offense in 2003. Catcher Doug Mirabelli threatened to fine any teammate who used the phrase “cowboy up” in the 2004 spring training camp because the upcoming season represented a fresh start. Led by new manager Terry Francona and fortified by the addition of starting pitcher Curt Schilling and closer Keith Foulke, the club was on a mission to erase the heartbreaking finish of 2003. Kevin got an up-close and personal look at just how competitive Curt Schilling was. “I remember Schilling was telling us he had tape of all the hitters. So I asked him if he had tape of my big blast against him that went 330 feet and barely cleared the fence,” Kevin chuckles. Kevin Millar hit 52 home runs during his three seasons with the Red Sox and he drove in 220 runs. But Red Sox fans remember him best for a walk: a walk in the ninth inning of Game Four of the 2004 ALCS with the Red Sox on the brink of elimination. After Millar’s walk, Dave Roberts replaced him as a pinch-runner, stole second base and scored the tying run on a Bill Mueller single. The Red Sox won Game Four in the 12th inning on a Big Papi home run and went on to accomplish the greatest comeback in sports history. 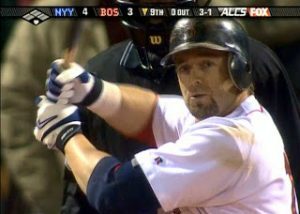 Kevin Millar played in 134 games for the Boston Red Sox in 2005 and then signed with the Baltimore Orioles for the 2006 season. He played in Baltimore from 2006 to 2008 and moved on to the Toronto Blue Jays in 2009. But in some sense he never really left the Red Sox. In 2007 the Red Sox faced the Cleveland Indians in Game Seven of the ALCS at FenwayPark. When the season is on the line every decision from the starting lineup through who will sing the Star Spangled Banner, down to who will throw out the first pitch is critical. And the Red Sox selected Kevin Millar of the Baltimore Orioles to throw out the first pitch. Apparently it was the right decision because the Red Sox defeated the Indians and went on to win their second World Championship in four years. Today Kevin Millar is the co-host, along with media veteran Chris Rose, of “Intentional Talk” which airs on the MLB Network for one hour at 5 pm ET every weekday. The high-energy show features interviews with active players and news from around MLB. Millar’s credibility with active players encourages them to open up and go beyond the typical interview. “Cowboy Up” has been replaced by “GotHEEEEM!” the catch-phrase Kevin uses whenever a player or fan is caught in a humorous video clip. Kevin and his wife Jeana live with their four children in Austin, TX. Fans can stay in touch with Kevin on Twitter at @KMillar15. 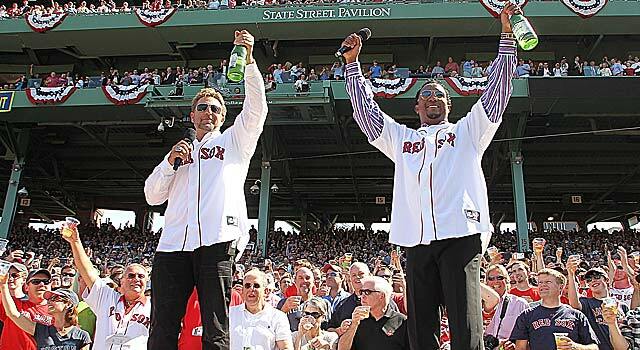 And what message does Kevin Millar have for Red Sox fans? “Please tell them how much I loved playing for the Boston Red Sox. Red Sox fans make all of us feel like rock stars. When I walk down the street I feel like Aerosmith or somebody. I have to admit that I wasn’t always a big Millar fan. But then I caught an episode of Intentional Talk and started to get a liking for him. Now, after reading this article, I have a better appreciation for him and what he did. His story is really a great example of determination and not giving up on your dream. Thanks! I have only recently found Intentional Talk and really enjoy it. It is nice to watch something that has many laughs and information. Keep up the good work. It is a feel good show. Millar will always be remembered but he should thank us big time for his media career. Without playing in Boston know one would know his name. Hey it’s mean but true. I am a firm believer that Kevin Millar was the sparkplug for the 2004 Red Sox . . . he was always seen laughing or pranking in the dugout. He kept the team loose and he contributed in every way. If he didn’t win the Tenth Player Award in 2004 he should have . . .